A black and white large format negative of William Rowley with his family's champion Collies. Harold Devine Rowley was born at Davidson, Saskatchewan in 1904. He came to Oshawa in 1928 and in 1934 he moved to Whitby. He enlisted in the Second World War and became a lieutenant in the Ontario Regiment (Tank) in France, Belgium and Germany. He was involved in the building of Club Bayview at Whitby in 1946 (Whitby's first night club). This was sold in 1948. He worked as an attendant at Ontario Hospital and retired in 1966. He became a Justice of the peace at Whitby from 1966 to 1989. 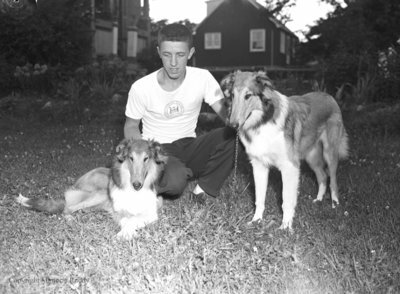 He was involved in boy scouts and raised collies as a hobby. Mr. Rowley died in Whitby in 1994 and is buried at Union Cemetery, Oshawa. Rowley Champion Collies, August 6, 1950, Marjorie Ruddy. Whitby Archives A2013_040_238.